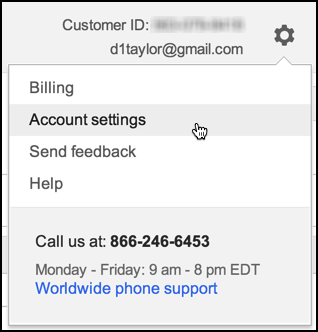 / How do I add an account to Google AdWords? I like how you think, ensuring that your boss has access to the backend of your Google AdWords campaign and yet wanting to set things up so that they can’t just monkey around with the settings, break things, and then complain to you that it’s not working properly. 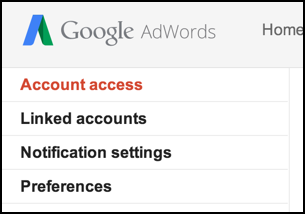  Fortunately, Google has you covered and it turns out that there are four different ways you can set up additional account access to your AdWords account. As with most Google interfaces, however, AdWords takes some poking around to figure out, but no worries, I’ve got ya covered. I’m going to assume you already have an account all set up (that’s more for the benefit of other people who read this). These instructions are actually generally useful any time you need to add additional access to your account. Choose “Account settings”, as you can see I’m doing above. I know this is going to be a surprise, but click on “+ USERS” to add a user. As it explains, you need their email address. In the case of your boss, that’ll be easy, I bet you send her twenty messages a day! I strongly recommend you include their name or a descriptive name so that later when you review settings you’ll know what’s what. From what you’ve described, “Read only access” sounds ideal. If you’re curious about the differences, note the tiny “?” icon adjacent to Access level. Click on it, and you’ll get the scoop on each of the four levels. Changed your mind before she approved the link? 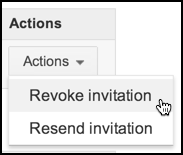 You can axe the invitation if you want by going to pending invitations. That’s all there is to it. Now go and impress your boss with your AdWords expertise! Greetings from Los Angeles! I’m bored to death at work so I decided to check out your blog on my iPhone during lunch break. I love the information you present here and can’t wait to take a look when I get home. I’m surprised at how fast your blog loaded on my phone .. I’m not even using WIFI, just 3G ..